If you want to add the FeedFlare to your blog follow the instruction below. 2. Click on the Feed Title. 3. 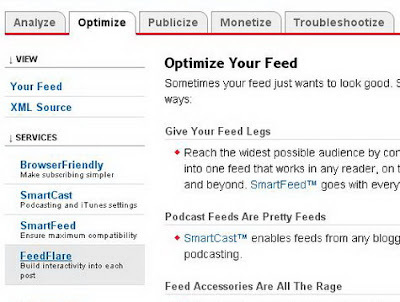 Click on Optimize Tab. 5. Check on the services you want to display in your Feed or on your Site. 6.There is a FeedFlare Preview/Ordering below the list of services. 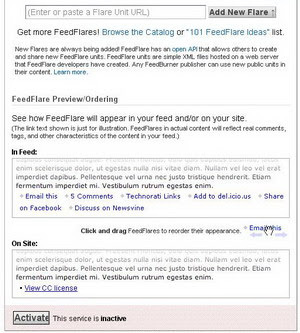 This lets you see how FeedFlare will appear in your feed and/or on your site. Just Click and Drag the links on the location that you want. 7.Click on "Activate".Now You will get this message. 8.Now in this window Before the Save button, there is a "Get the HTML code to put FeedFlare on your site". 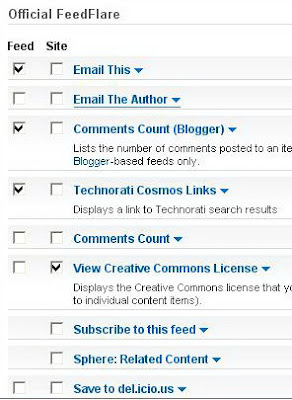 Choose the Blogging Platform as "Blogger"
9. A pop-up window will appear and it contains the instructions on how you embed the Feed burner FeedFlare on your blog.Just follow the instructions.Now wait about 20 minutes and refresh your site.Look at the example below.